Welcome to the Wilwood Engineering Contingency page. Here you can learn more about the series that Wilwood currently provides contingency; whether with product or product/monetary certificates. Each program is different so find your series below to learn how you can earn contingency from Wilwood. Wilwood continues to work with different series to build contingency programs. Check back often to see which new series have been added to the Wilwood contingency program. Good luck this season! Drivers must display the Wilwood contingency decal on the rear bumper of their racecar prior to and during participation in official on-track activities. Product and product certificates distributed to select finishers at the three regional championships and The Wilwood Grand Prix at Mazda Raceway Laguna Seca, July 14 - 16. Run at least one (1) Wilwood contingency decal on each side of competition vehicle(s) at all ChumpCar events. $50 product certificate to the seventh place finisher at each USMTS event. One winner will be randomly drawn from all drivers that finished seventh throughout the year to receive a complete Wilwood brake kit. $25 Wilwood product certificate to competitors at participating tracks. Competitors must run two sets of decals: One (1) Contingency Connection decal and one (1) Wilwood contingency decal on each side of the race car. A pair of front and rear brake rotors to the 2017 IMCA Modified, Stock and Northern and Southern SportMod National Champions. A $100 product certificate to the 2nd – 5th place finishers in final national points from each division. A set of front and rear wide 5 hubs to the IMCA Late Model National Champion. A $100 product certificate to the IMCA Late Model 2nd – 5th place finishers in final national points. 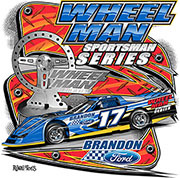 A $50 product certificate to the 6th – 10th, 15th, 20th and 25th place finishers in the Modified main event at the Super Nationals. A $50 product certificate to the 6th – 9th place finishers in the Stock Car, SportMod and Late Model main event at the Super Nationals. Division-specific product and product certificates to be distributed through a random drawing at the end-of-year banquet. Eligible drivers must display a Wilwood decal on both sides of the race vehicle. $50 Wilwood product certificate to the Wilwood heat race winner at every 2017 POWRi Lucas Oil WAR Sprint League race. $50 Wilwood product certificate to the 13th place feature finisher at every USAC Silver Crown, National Midget and National Sprint Car race. $50 product certificate to Wilwood Heat Race Winner at every NRA Sprint Invaders race. Wilwood Tough Brake Award – Buy one axle-set of brake pads and receive a second set (of equal or lesser value) free. $50 product certificate to the 4th place feature finisher at every Midwest Truck Series race. Eligible drivers must display a Wilwood decal.